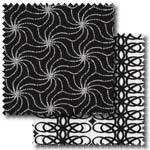 Pelenna Patchworks: New Michael Miller Black & White fabrics now available! New Michael Miller Black & White fabrics now available! Just uploaded is a small selection of new black & white fabric prints from Michael Miller - including stripes, spots, ribbons and fleur de lis, this is a collection of unusual designs great for any monochrome quilts!